Mark ’email as unread’ feature has been present in web based email services, like mark as unread in Gmail, Yahoo and Live Hotmail. This is a useful feature to mark email messages which as unread or important for future reading. Now this feature is also included on iOS devices interface with iOS 5 update. 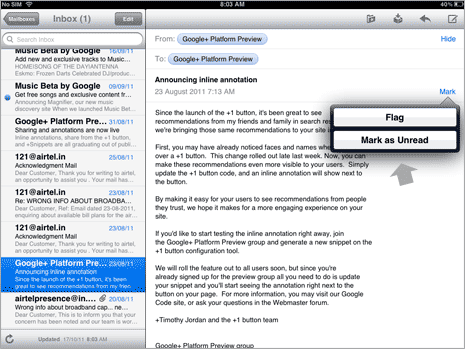 So if you are checking email messages on iPad or iPhone, you can easily mark one or more specific email messages as unread (and important) or even flag them. 1. Tap on Mail app icon at the bottom of iPad home screen. Once Mail application is opened, tap on Inbox to view email messages from which you can mark either as unread or important. 2. To mark specific email message, tap to open that message. Then on right pane, tap on Mark button and then tap on ‘Mark as Unread’ option. This will mark that specific email as unread and important. 3. To mark multiple email messages as unread and important – tap inbox option to view list of email messages and then tap on Edit button at the top. 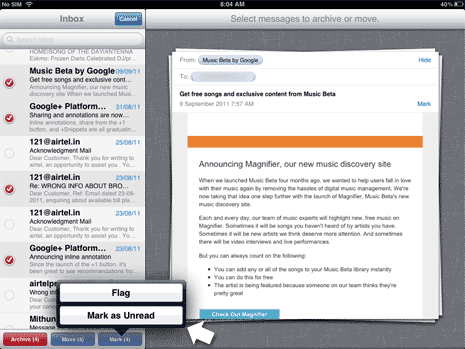 Now tap to select email messages that you want to mark as unread and important. After selection, tap Mark button at bottom left and then tap to select ‘Mark as Unread’ option. Once you mark one or more email messages as unread and important – those email messages will have blue dot or icon on their left side for identification of their unread and important status. You can easily reverse the unread routine – just tap to select messages which are marked unread, tap Edit button, tap Mark button and then tap Mark as Read option. How to Sync Yahoo Calendar and iphone calendar?